Nationality: Noun and adjective: Aruban(s). Annual population growth rate: 1.46%. Ethnic groups: Mixed white/Caribbean Amerindian 80%, other 20%. Religion: Roman Catholic 81%, Evangelist 4.1%, Protestant 2.5%, Jehovah's Witness 1.5%, Methodist 1.2%, other 5.3%, unspecified or none 4.6%. Health: Infant mortality rate: 16/1,000. Life expectancy — 72 years for men, 78 years for women. Work force (54,720): Most employment is in wholesale and retail trade and repair, followed by hotels and restaurants and oil refining. Unemployment — about 5.7% (2007). Branches: Executive: monarch represented by a governor (chief of state), prime minister (head of government), Cabinet. Legislative — unicameral parliament. Judicial — Joint High Court of Justice appointed by the monarch. 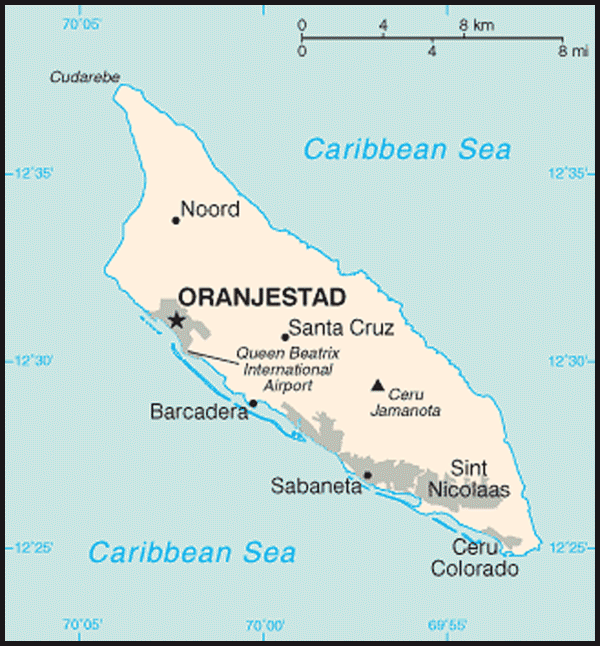 Subdivisions: Aruba is divided into eight regions — Noord/Tank Leendert, Oranjestad (west), Oranjestad (east), Paradera, Santa Cruz, Savaneta, Sint Nicolaas (north), and Sint Nicolaas (south). Political parties: People's Electoral Movement (MEP), Aruba People's Party (AVP), Network (RED), Aruban Patriotic Movement (MPA), Real Democracy (PDR), Aruba Liberal Organization (OLA), Aruba Patriotic Party (PPA), Aruba Democratic Alliance (ALIANSA), Socialist Movement of Aruba (MSA). Per capita GDP (2008): $25,922. Trade (2009): Exports: $138 million: oil products, live animals and animal products, art and collectibles, machinery and electrical equipment, transport equipment. Major markets in value — Panama (23.89%), Colombia (17.42%), Netherlands Antilles (20.51%), U.S. (9.35%), Venezuela (12.60%), Netherlands (7.56%). Imports — $1.092 billion: crude petroleum, food, manufactures. Major suppliers — U.S. (49.5%), Netherlands (16.14%), U.K. (4.94%). Part of the Kingdom of the Netherlands, Aruba has semi-autonomy on most internal affairs with the exception of defense, foreign affairs, final judicial review, and "Kingdom matters" including human rights and good governance. The constitution was enacted in January 1986. Executive power rests with a governor, while a prime minister heads an eight-member Cabinet. The governor is appointed for a 6-year term by the monarch and the prime minister and deputy prime minister are elected by the legislature, or Staten, for 4-year terms. The Staten is made up of 21 members elected by direct, popular vote to serve 4-year terms. Aruba's judicial system, mainly derived from the Dutch system, operates independently of the legislature and the executive. Jurisdiction, including appeal, lies with the Common Court of Justice of Aruba and the Kingdom-level Supreme Court of Justice in the Netherlands. The Aruba People's Party (AVP), led by Mike Eman, won the September 25, 2009 parliamentary elections, capturing 12 of the 21 seats; People's Electoral Movement (MEP) dropped from 11 to 8 seats, and Real Democracy Party (PDR) took the final seat. The Network of Eternal Democracy (RED) and Aruban Patriotic Movement (MPA) did not return to parliament. Through the 1990s and into the 21st century Aruba posted growth rates around 5%. However, in 2001, a decrease in demand and the terrorist attacks on the United States led to the first economic contraction in 15 years. Deficit spending has been a staple in Aruba's history, and modestly high inflation has been present as well, although recent efforts at tightening monetary policy may correct this. Oil processing is the dominant industry in Aruba, despite the expansion of the tourism sector. Approximately 1.25 million tourists per year visit Aruba, with 75% of those from the United States. The sizes of the agriculture and manufacturing industries remain minimal. Aruba conducts foreign affairs through the Kingdom of the Netherlands, whose embassies and consulates issue visas for travel to the island. Aruba has strong relations with other Caribbean governments. 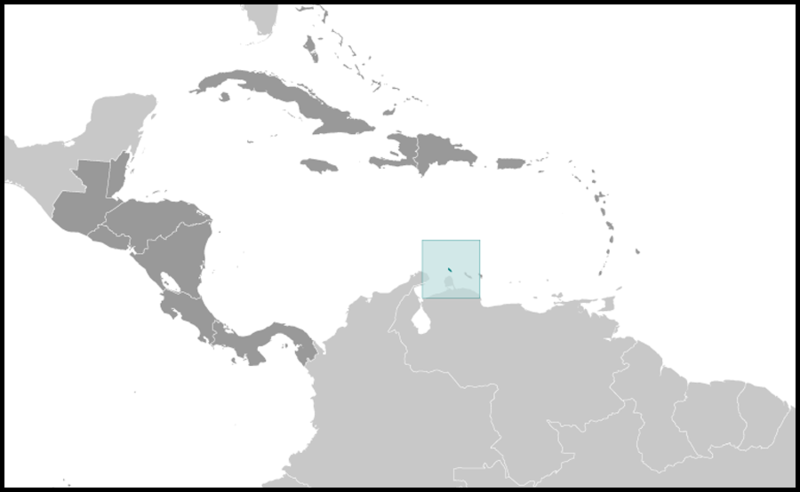 Aruba is an observer in the Caribbean Community (CARICOM), an associate member of the World Trade Organization through the Netherlands, and is a full member of the Association of Caribbean States.